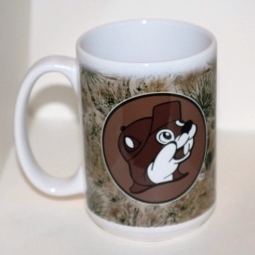 This web page is a collection of cups, glasses, and mugs that have been collected over the years. Most have been bought at various attractions when visiting them, though a couple of been given by family members. Feel free to send ones that I do not have to the address at the bottom of this page. They will be posted, assuming they are in good taste, with credit provided to the contributor. Note: click the thumbnail picture to get a larger picture displayed; links have been provided to the attractions, cities, and states. Picked up at an AAFES store at Ramstein Air Base (near Kaiserslautern) in 1990.